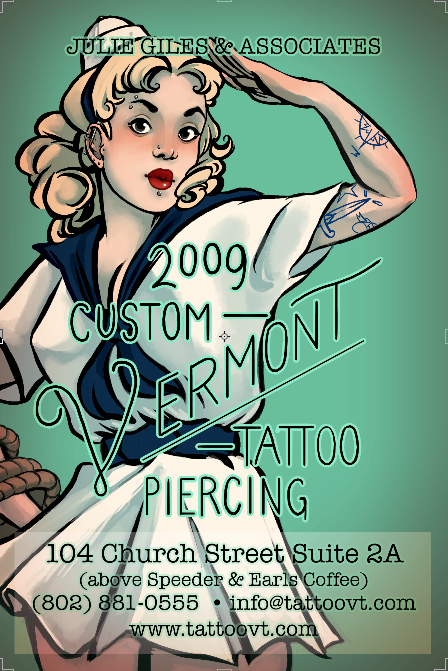 We are an all-custom tattoo and body piercing studio in downtown Burlington, Vermont. Located in the heart of Burlington on the scenic Church Street Marketplace, we are small, yet overflowing with talent and experience. Call or email us to schedule appointments. We do tattoo and pierce under the age of 18 with parental consent, and under artist discretion. The parent has to be present with valid photo I.D. We Now Have A New Artist! Vermont Custom Tattoo and Piercing is very excited to welcome you all to our newest artist Roman Bolozan!! He joins us from the country of Moldova and has been tattooing for over 11 years. Make sure to check out his work in the gallery, its outstanding! Give us a call or email us to book an appointment with him. Vermont Custom welcomes Aja! Comments Off on Vermont Custom welcomes Aja! Welcome back, Becca!!! Comments Off on Welcome back, Becca!!! Julie is back!! Comments Off on Julie is back!! Goodbye Sinz! We will miss you as well. Comments Off on Goodbye Sinz! We will miss you as well. Goodbye Becca Blust, We miss you! Comments Off on Goodbye Becca Blust, We miss you!